Office Closing & Opening Dates – Merry Christmas & Happy New Years! What a year! We’ve been so busy that just the thought of our office closing for the year makes us a little sad, but also relieved. Please be advised that our office has now closed for the year and will re-open on Monday 25 January, 2019. 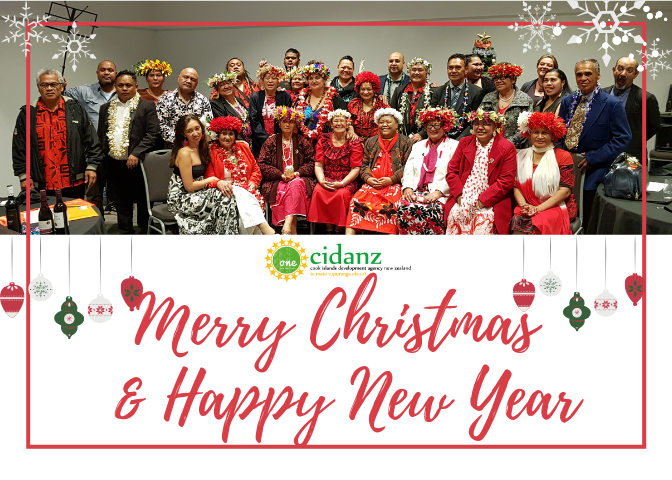 From our CIDANZ family to yours, we’d like to wish you all a very Merry Christmas and safe New Years. Thank you all for a wonderful year! http://www.cidanz.co.nz/wp-content/uploads/2017/10/Header_v3.png 0 0 Janet Akai http://www.cidanz.co.nz/wp-content/uploads/2017/10/Header_v3.png Janet Akai2018-12-21 17:18:082018-12-21 17:18:18Office Closing & Opening Dates - Merry Christmas & Happy New Years! We’re looking for an culturally sound, experienced and energized youth development worker to join our team. If you are passionate about supporting young people to build leadership, confidence, resilience, well being and entrepreneurship, and would like to work with a small team, we want to hear from you. You will be working 20 hours per week (for first 6 months, with the option to go full time early new year) working from Monday to Thursday on a rotating AM/PM shift pattern. AM shift is 10:00am to 3:30pm, PM shift is 3:30pm to 9:00pm in order to be available to young people at critical time. We aim to provide innovative and culturally appropriate development services in the community to young people aged between 8 and 15. We believe in the importance of family, community, connection and relationships – and in the ability of young people to shape their own futures. You’ll be reporting to the Chief Executive and working in a team of family and community development workers. understanding of care and experience working with young people. hold a current New Zealand first aid certificate or be prepared to obtain one. In this role, you can look forward to flexible work arrangements, a great team around you every day working in an organisation that believes in its’ purpose to Unite and Prosper families and communities. Be part of a supportive work environment where life balance is encouraged, people are valued and new innovative solutions are the norm! **All new appointees into the Organisation require background checking. Under the requirements of the Vulnerable Children’s Act 2014, new employees that are identified as coming under this act are required to undergo further safety checks as part of the recruitment process. ‘Island Night’ – Stall Holders Welcome! Summer is just around the corner! So if you are looking for another fundraising alternative for your Family, Church Group, Sports Team or Community Group? Come and join us at the Island Night. 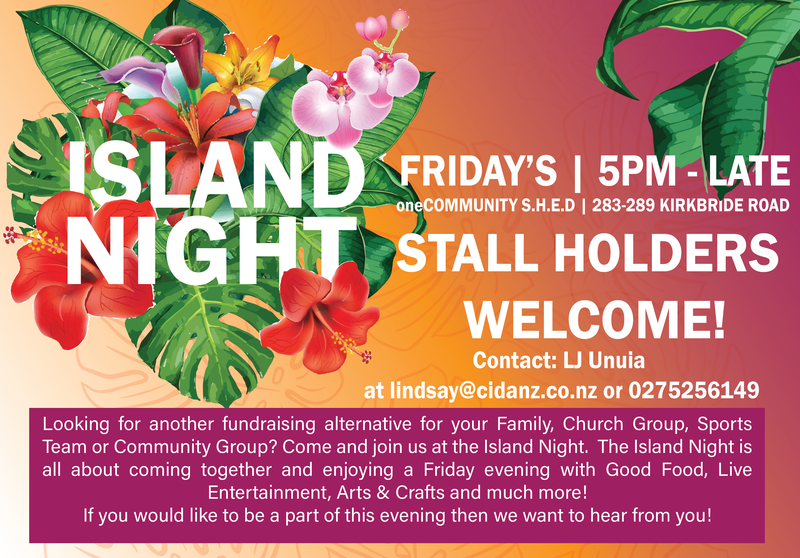 The ‘Island Night’ is all about coming together and enjoying a Friday evening with Good Food, Live Entertainment, Arts & Crafts and much more! If you would like to be a part of this evening then we want to hear from you! Contact Lindsay Unuia at lindsay@cidanz.co.nz or on 0275256149.
http://www.cidanz.co.nz/wp-content/uploads/2017/10/Header_v3.png 0 0 Janet Akai http://www.cidanz.co.nz/wp-content/uploads/2017/10/Header_v3.png Janet Akai2018-08-30 11:50:022018-08-30 11:50:02'Island Night' - Stall Holders Welcome!